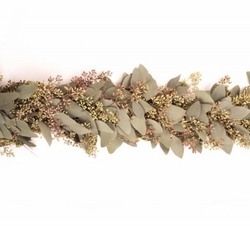 Our Seasonal Eucalyptus garland is created using either Seeded Eucalyptus (pictured) or Silver-Dollar Eucalyptus. Both have very similar droopy, grey leaves. During the summer months Silver-Dollar will be the Eucalyptus available. This item will stay fresh for approximately 4-5 days, depending on care and climate.